Along with all of the partying and the excesses, the Holiday season is one of the most difficult parts of the year to stay disciplined in terms of the foods we eat and the exercise we do. This is why a lot of people decide to sign up to a gym as part of their new year resolutions. 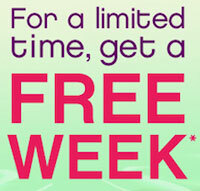 Following this train of thought, Curves is suggesting that you take a head start by enjoying a one week free trial at any one of their locations. By clicking on the link located above, you will be automatically re-directed to this promotion’s page for your free guest pass. Completing the redemption process should only take a few minutes tops and the questions that you will need to answer are not invasive. Plus, you will also be able to find out where the nearest Curves gym is located. New to the concept behind Curves gyms? The main things that you need to know is that it is for women exclusively and that the workout consists of a 30 minute session that is meant to be both fun and efficient. The formula seems to be appreciated, since Curves is said to be the largest fitness franchise with over 10,000 locations worldwide. Check out these Curves reviews if you’re interested in learning more about this gym before trying it. Do you know anyone who has ever been to a Curves gym? Comment below with feedback?